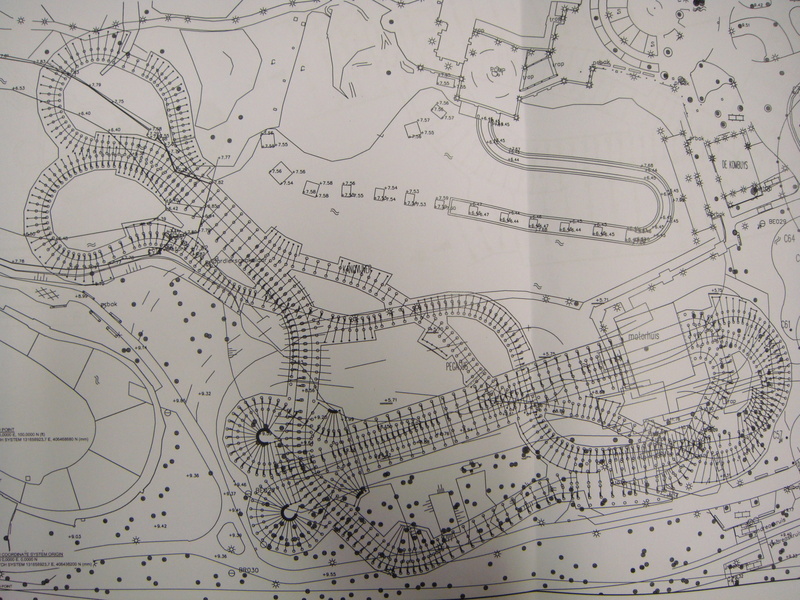 Dueling Woodie: Joris en de Draak @Efteling NL : Theme Park News & Construction! 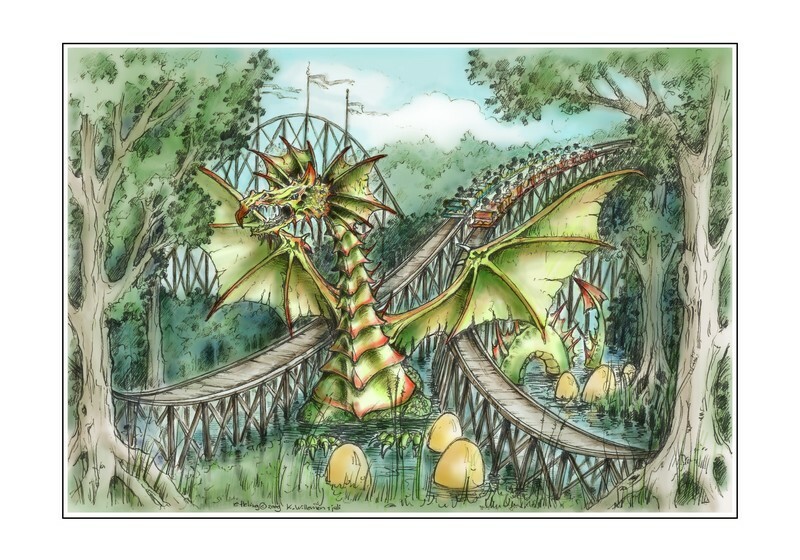 Efteling, Netherlands is planning a new coaster to replace their current woody "Pegasus"
It's going to be a dueling/racing woody named "Joris en de Draak" (George and the Dragon). Last edited by hyyyper on July 20th, 2009, 9:33 am, edited 1 time in total. I kept thinking that there wont be another death, THE UNIVERSE LOVES PROVING ME WRONG!!!!! This is a roller coaster... chill. Finally this intamin crap is removed from the park, hopefully they will build a decent woody in place. Last investment was a total faillure in a ride-only perspective, themeing was okay, but the track of "de vliegende hollander" was just rubbisch.... I hope for Europe's first GCI racer!! Well, it certainly appears like it will be a fairly unique ride; there aren't a whole lot of dueling woodies in the world, are there? Lightning Racer is the only one I can think of. The thing that caught my attention is the length vs. height. 25 m tall for a 1400 m long ride? That's a 56-to-1 length to height ratio!! Maybe it will have multiple lifts? Most wooden coasters appear to have approximately a 35-40 to 1 ratio. Grand National & Stampida are the only ones I can think off in Europe? Should be good. I quite enjoyed Pegasus though. Uhm Gwazi you hussies. The best of them all. ohhhh....ok. The last link said it was 1400 m each. OOPS. It's sad to see one of the old Efteling rides go but hopefully we'll get one heck of a coaster in return! Looks good, finally a good coaster in the Efteling. I love the construction of GCI's. The turns where the both rides will meet eachother again. I also expect that the dragon will stand on at this spot. Advertising on the construction itself. The ride will feature a triple up after the first drop. The first small one is hidden between the structure. The 2nd one you can see on this photo. And here's the 3rd up from the full triple up. I'll be flying over the station. Sort of an overview of the ride. Look at the difference of both tracks. One is kinda drawn out with hills, meanwhile the other ride looks pretty fun as it takes all those awesome twists and turns. Onride shot taken from the Python. You can view the exits from the flyover. Overview from the long dueling and racing part of the track. The turn after the flyover. The area after the flyover a bit better in view. A complete overview taken from the Python. Already a much clearer view of the only area that still has to be build. And the best view that I could have shot. [:D] It looks that my prediction of 2 completely different rides will come true. One ride for the daredevils and the other ride for the softer starters. Again the 2 turns after the flyover. But now taken from groundlevel. The station area made also some good progress. You can already see some stairs that'll probably be the stairs to the operator booth. A whole chaos of trackwork that's going underneath the lifthill. Onride photo taken from the Flying Dutchman. One more, hopefully with a bit better view. And quickly the last one before the splash. And then i'll close this off with a picture from the river rafting. Looks good so far.Efteling really needs a good woodie. GCI has been constructing some great rides lately. This looks like no exception. I hope the pacing is fast enough for some nice airtime. Those are some great pics dirk, she is coming along nicely.